Oracle has quietly published a roadmap for its legacy Sun SPARC and Solaris platforms. Big Red's not offered a whole lot of detail, confining itself to the single slide below. The slide is available here as a PDF or as an embiggened image here. What to make of the slide? Optimists will be pleased that Oracle appears to have three generations of silicon in mind and appears committed to SPARC until 2019 and beyond. Pessimists might wonder if the “core enhancements” due around 2019 represent a worryingly vague statement of direction and/or intent. 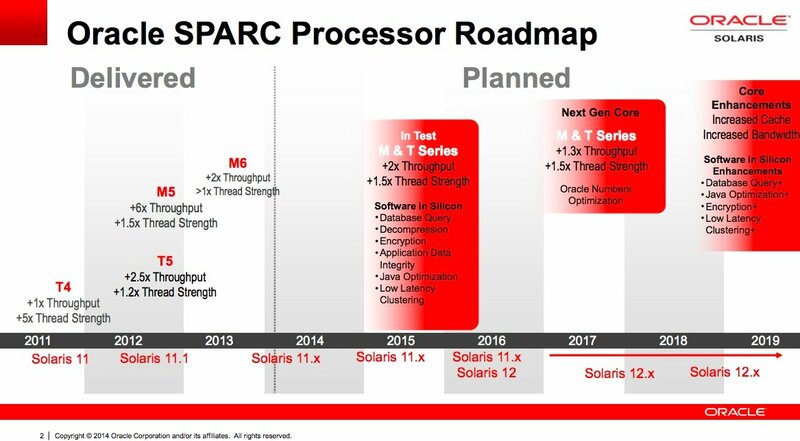 The planned 2017 and 2018 enhancements to thread strength and throughput also look incremental compared to the heftier enhancements planned for 2015 and 2016, which could be worrying for those who need SPARC to scale.